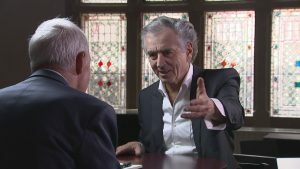 The French philosopher Bernard-Henri Lévy says Britain is at the intellectual heart of Europe and needs to stay there. And he’s putting his views on stage. Last Exit Before Brexit depicts a speechwriter who has to give a keynote address at a conference about Brexit and can’t manage to write it.